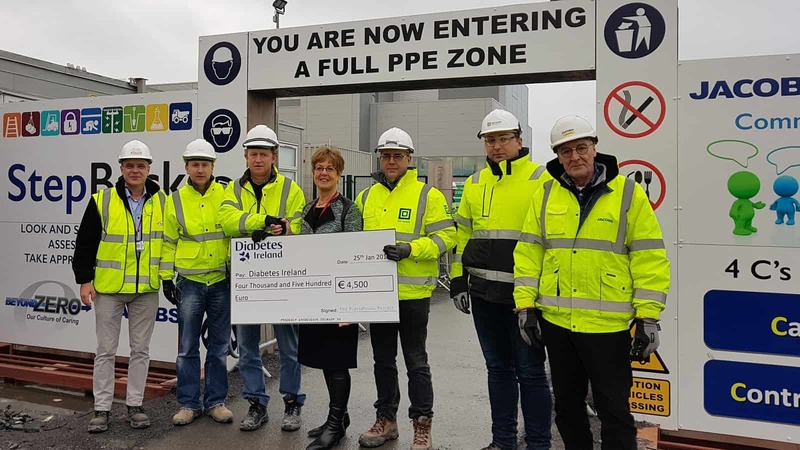 Diabetes Ireland presented with generous donation of €4,500 at Takeda Project on behalf of Duggan Brothers, Takeda, Jacobs Engineering & Leo Lynch – Duggan Brothers Ltd.
We were delighted to present Diabetes Ireland with a generous donation of €4,500 at our Takeda Project in Piercetown, Co. Meath. Takeda proposed a positive initiative on site from June 2018 – December 2018. The initiative was called ‘The Safety Observation Report Charity Donation Nomination’. For every SOR received within the 6 months €1 was donated to a nominated charity. During the 6 months 28,000 SOR’s were received, which meant that €28,000 was donated to 5 remarkable charities – ours being Diabetes Ireland. (L-R Peter Cudden (Takeda), Niall Lane (Duggan Brothers), Cathal Miller (Duggan Brothers), Anna Clarke (Diabetes Ireland), Brian Sterling (Leo Lynch), and James Hayde (Jacobs Engineering). At this time of year donations are low which meant that the charities were delighted to receive such generous donations and to be a part of this remarkable initiative. Diabetes Ireland is the national charity dedicated to helping people with diabetes. They achieve this by supporting, educating and motivating individuals, whilst also raising public awareness of diabetes its symptoms and funding research into finding a cure. Patient support via telephone call 01 842 8118 and local support branches. Information via website, social media, literature and our magazine “Diabetes Ireland”, posted three times annually. Support for children with diabetes and their parents through Sweetpea Kidz Club; children and adolescent adventure activities; family weekends; and parent support groups. Direct health education for people with diabetes through conferences and community-based structured education programmes. Financial services: negotiated motor and health insurance rates. Advocacy and liaison with: clinics, services, the HSE and the Department of Health and Children. Professional support via major annual multi-disciplinary conferences, practice support packs and Diabetes Professional magazine. Co-ordinating national and regional local diabetes awareness campaigns about the symptoms and risk factors for diabetes. Health promotion initiatives including school’s awareness, workplace awareness, early detection and prevention initiatives, and diabetes screening. Well done to all involved and thank you for your continued support with the Safety Observation Report programme.